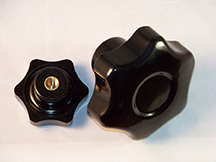 6 lobe socket and stud knobs have highly polished smooth surfaces and do not show a parting line. Very sturdy and attractive for any industrial or commercial application. See PDF for part number detail.